Indigenous communities in Lares, Peru—about 90 miles (150 kilometers) north of Cusco—live at 12,000–14,500 feet (3,660–4,420 meters) above sea level, high in the Andes Mountains. Men tend the fields while women weave high-quality textiles that they sell intermittently at markets. Children attend school until they are also needed to work in the fields or help out with household duties. The AASD has mapped approximately 60 miles (97 kilometers) of trails, including this one that goes from Quishuarani to Cucani. The district of Lares straddles the last eastern high passes of the Andes and descends into the tropical highlands. The closest market is at least three hours away by bus on a one-lane dirt road that winds precariously along steep mountain drop-offs. The nearest communities are about four hours away by foot, accessed via a network of well-trodden trails. Although the people living in the Lares region persevere despite limited resources and harsh living conditions, these factors—coupled with fragmented government aid and a dearth of infrastructure—render these communities relatively inaccessible to visitors. Tourism is a huge industry in Cusco, though. While some travelers do venture out of the city to visit natural hot springs around the Lares district, in general they do not utilize the trail networks, nor do they make it into these small communities. To provide its people with opportunities for economic development, the Lares district government is attempting to take advantage of this market by promoting rural tourism. The Andean Alliance for Sustainable Development (AASD), which works with Peruvian communities to identify ways to address livelihood challenges, is supporting this initiative by employing GIS. 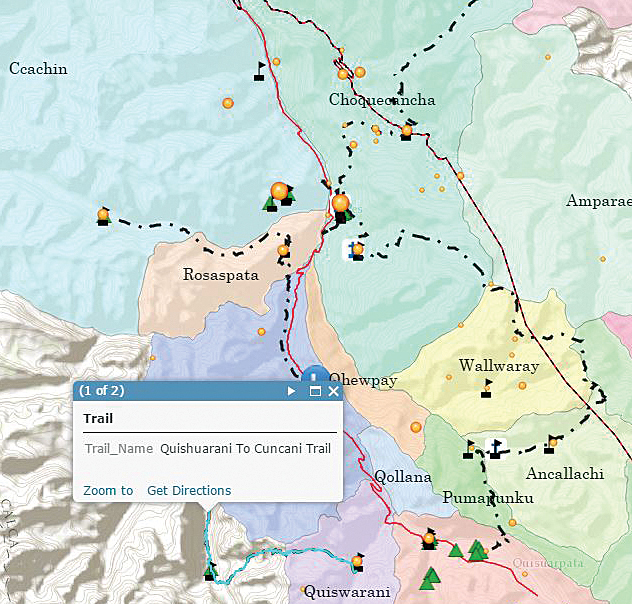 Specifically, the AASD is using ArcGIS Online—and adventurous volunteers—to create a map of the trail networks that connect Lares and its surrounding districts. The result will be a rural tourism circuit that takes travelers beyond the hot springs and into these communities. When volunteers arrive in Lares, they are provided with local guides and fitted with Garmin GPS units to collect the track lines of these previously unmapped trails. They also use a smartphone survey app to collect area-of-interest points such as guesthouses, markets, camping and recreational areas, and hot springs. These locations are collected and stored offline, since there are no active cellular zones in the region. The volunteers then use a wireless Internet connection each night to synchronize the data with a database, and a GIS specialist loads the information into a geodatabase on an as-needed basis. This data conversion process is tedious, however, so the AASD is currently implementing Collector for ArcGIS 10.3 so that when volunteer hikers enter an area with cellular or wireless Internet coverage, their data will automatically sync into AASD's ArcGIS Online geodatabase. Additionally, the app can be downloaded to Android and iOS devices, which will allow the volunteers to use their own smartphones. 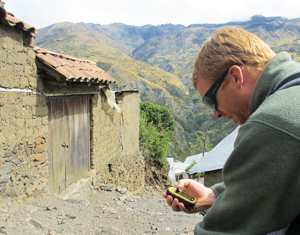 2013 summer program volunteer Kevin Zavoral collects data in Choquecancha in Peru's Lares district. Volunteers typically cover more than 3.7 miles (6 kilometers) per day at very high altitudes. AASD trekkers have already mapped approximately 60 miles (97 kilometers) of trails. And they are learning about mapping and GIS while doing it. "The AASD mapping project allowed me to get valuable field experience while mapping thousand-year-old trails that have never been mapped before," said Kenneth Eggering, who hiked and collected data for some Lares trails during the summer of 2014. "The beauty of these trails is that they are used every day by indigenous communities." 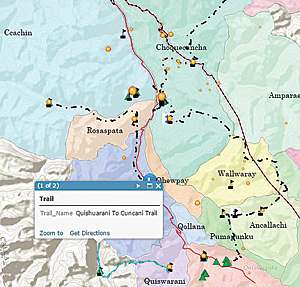 Once the trails are mapped, tourists will use an interactive map application—which was originally created in ArcGIS for Desktop Advanced and will be published to the AASD's ArcGIS Online account—to design their own hiking trips by selecting a trail or a series of trails around the Lares district to trek. After the trekkers define an area of interest on the map and select an appropriate scale, they will be able to either download it to their portable devices or print it out to take with them (ideally both, in case of electronic malfunction). Beyond providing tourists with the opportunity to explore Peru's isolated areas and trails, these detailed maps will bring the market to the locals. Rather than having to regularly travel long distances and deal with middlemen to sell their goods, members of these expansive rural communities will be able to welcome tourists and sell their goods within their own environs. The AASD obtained its ArcGIS software through the Esri Nonprofit Organization Program. For more information on this project, contact Aaron Ebner or Jim Valenza, or visit the AASD website.